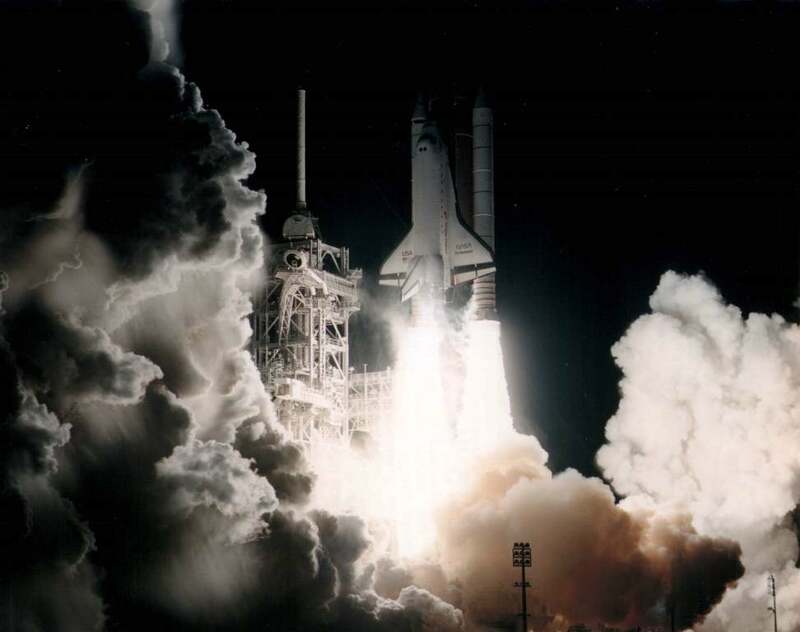 On Jan. 11, 1996, Space Shuttle Endeavour lifted off from NASA’s Launch Complex 39B at Kennedy Space Center, Florida, on STS-72 – a mission, among other things, that was sent aloft to retrieve a Japanese satellite and return it to Earth. The nearly nine-day mission was commanded by NASA astronaut Brian Duffy, a U.S. Air Force pilot who once served as Director of F-15 Tests at Eglin Air Force Base, Florida. Also on board were pilot Brent Jett, and mission specialists Leroy Chiao, Daniel Barry, Winston Scott, and Japan Aerospace Exploration Agency (JAXA) Koichi Wakata. The mission’s launch was delayed for approximately 23 minutes due to communication glitches among some of the ground sites, but otherwise, the countdown to the mission’s start was mostly uneventful. STS-72 was the first shuttle flight of 1996, the mission’s road to launch was followed by a PBS crew throughout for a documentary entitled Astronauts, hosted by Bill Nye, which aired on PBS on July 17 of the following year. 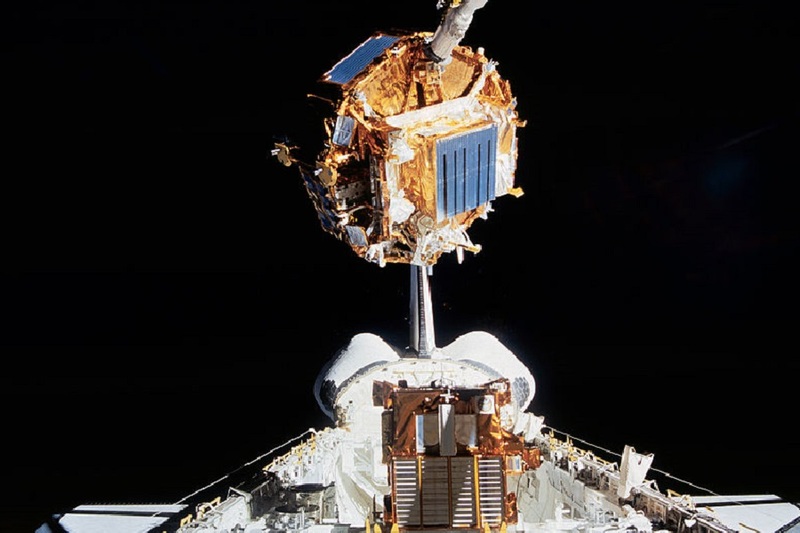 The primary objective of STS-72 was to retrieve the Japanese Space Flyer Unit (SFU) after its ten months on orbit conducting biological, physics, and materials experiments. SFU had been launched on March 18, 1995, from the Tanegashima Space Center, located off the coast of Japan, on an H-II 3F rocket. The SFU spacecraft carried an infrared telescope; a 2D array system; HVSA, a solar array which generated electricity to power the onboard experiments; a Space Plasma Diagnostic Package (SPDP) to measure the effect of speed on gravity. Also on SFU was EPEX, which conducted experiments relating to the manufacture and maintenance of fuel in space as well as MEX, which experimented with the behavior of liquid in space. Lastly, there was BIO, which took eggs into space to observe a live specimen hatching in the microgravity environment. Wakata retrieved SFU using Endeavour’s robotic arm on flight day three. Unfortunately, the satellite’s solar arrays had not properly folded into place, and it was operating on battery power. It was decided to jettison the solar arrays in order to bring the vehicle aboard Endeavour. Wakata would go on to become the first Japanese commander of the International Space Station (ISS) in 2014. STS-72 was Wakata’s first mission to orbit. He would go on to fly three more times into space – twice on a shuttle and once on a Russian Soyuz spacecraft. 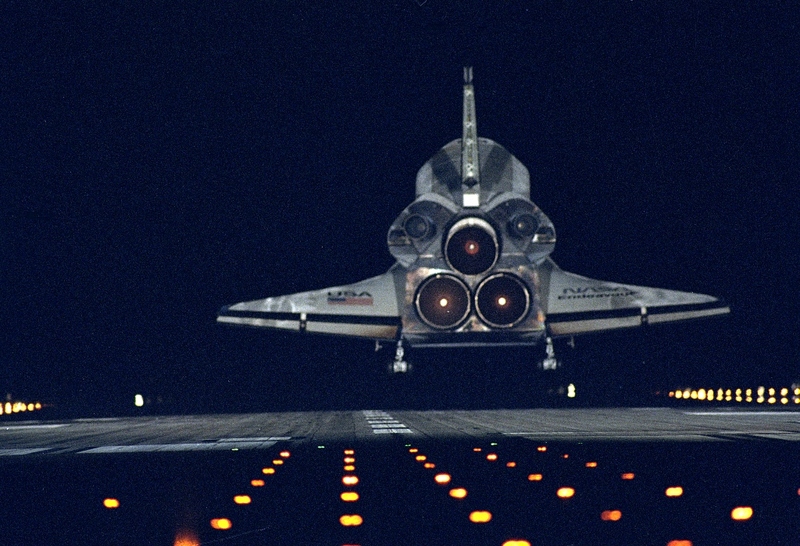 Endeavour also carried the Shuttle-Pointed Autonomous Research Tool for AstroNomy (SPARTAN), a reusable, free-flying, unmanned spacecraft equipped with four experiments for the Office of Aeronautics and Space Technology (OAST). Wakata deployed the appropriately named “OAST-flyer” on Jan. 17, 1996. The spacecraft carried the Return Flux Experiment (REFLEX), which tested the accuracy of computer models in predicting contaminants on the surfaces of sensitive objects such as lenses. SPARTAN also contained the Solar Exposure to Laser Ordnance Device (SELODE), which tested new techniques of firing pyrotechnics using fiber-optic laser pulses; the Global Positioning System Attitude Determination and Control Experiment (GADACS), which tested thruster firings through the SPARTAN Packet Radio Experiment (SPRE) – a University of Maryland experiment that supported amateur GPS data through GADACS. After SPARTAN was deployed, pilot Brent Jett maneuvered Endeavour to a distance of 44 miles (72 km) from the newly-deployed space observatory. When the time came for deployment, SPARTAN realigned itself for rendezvous, as it was designed. While SPARTAN was deployed, mission specialists Leroy Chiao and Dan Barry conducted an extravehicular activity (EVA) in order to construct a portable work platform. This was a prototype for a mobile workstation on the ISS. After assembling the platform, Chiao and Barry attached it to the end of Endeavour’s robotic arm. This allowed Jett to maneuver various pieces of equipment in a manner similar to what would be required during the orbiting laboratory’s construction. “The EVAs that were conducted by Leroy, Winston and Dan helped to evaluate some of the tools and techniques that were planned for the ISS. If you look at what the station has become – I think it’s safe to say they did a great job,” Duffy said. They then unfurled the Rigid Umbilical (RU), which simulated the fluid and electrical umbilicals that would eventually connect Space Station modules to the truss structure and the solar arrays. “I was honored to be part of an incredibly talented, international team that began a very complex mission twenty years ago today. After many years of planning and training, teams in the U.S. and Japan worked together seamlessly to retrieve the Space Flyer Unit satellite to be brought home after a year in space and returned to Japan. The mission demonstrated the true value of the space shuttle… the ability to carry 25 tons to orbit and bring 25 tons home,” Duffy told SpaceFlight Insider regarding the flight. The day after the retrieval of the SPARTAN, Chiao and Scott commenced the mission’s second EVA, testing a portable utility box that would hold fluid lines and avionics on the ISS. Endeavour returned to Earth on Jan. 20, 1996, having successfully accomplished all her mission objectives. The orbiter would go on to fly 15 more missions (the orbiter was launched 25 times in total since its first flight in 1992). For Duffy, the mission served not only to achieve objectives laid out by NASA, JAXA, the U.S. Air Force and other entities, but it also provided him with experiences, both professional and private that he cherishes to this day. “What can I say about Koichi? What a guy! He’s so level-headed and fun to be with, but in Japan he’s bigger than Elvis! STS-72 was such a great mission and experience that I wanted to do it again and was given the opportunity on STS-92 (which flew in 2000),” Duffy told SpaceFlight Insider. Great article – thanks for posting! What a great mission to be a part of…I was fortunate to serve as one of the Shuttle Flight Directors for STS-72 and was Flight Director for the EVA…which tested to cooling of the suit in the shadow if the Orbiter in an extreme cold test. And Yes….Koichi was “THE MAN”!!!!! !